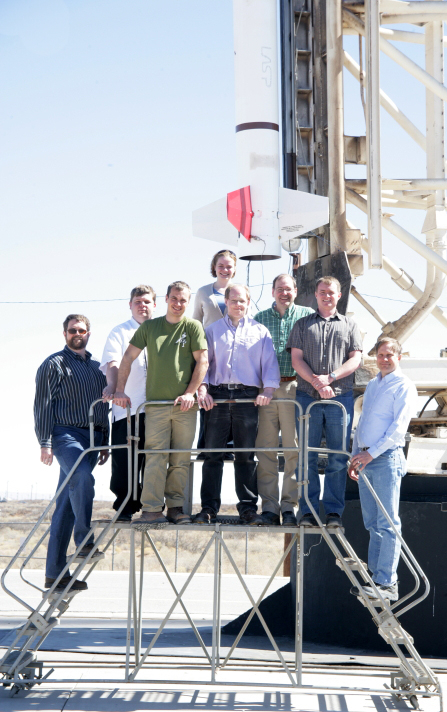 LASP scientists will launch a sounding rocket this Saturday, June 23, from the White Sands Missile Range in New Mexico, to check the performance of the EUV Variability Experiment (EVE) onboard the NASA Solar Dynamics Observatory (SDO). The scientific rocket will carry a near-replica of the SDO EVE satellite and will calibrate the EVE optical system, which measures solar energy. The rocket is expected to reach an altitude of about 300 km. Built and controlled by LASP, the EVE instrument measures solar extreme ultraviolet (EUV) irradiance, or the energy from the Sun that heats most of Earth’s thermosphere. EUV data help scientists understand the Sun’s influence on Earth and near-Earth space, including potentially hazardous space weather phenomena like solar wind. Sounding rocket calibration flights ensure the accuracy of EVE-collected data by measuring any natural damage to the EVE instrument in space. Saturday’s test will be the third EVE calibration performed since SDO was launched into Earth’s orbit in February 2010. Sounding rocket launches are planned annually throughout the mission’s five-year duration. The last calibration occurred in March 2011. LASP provides the scientific instruments for SDO EVE sounding rocket launches, and NASA provides all the other subsystems, including launch vehicles, telemetry, altitude control, and parachute recovery. Saturday’s calibration is supported by the NASA Sounding Rocket Operations Contract (NSROC). For more information on LASP’s involvement with SDO EVE, please visit http://lasp.colorado.edu/home/eve/.